... little more than the shadow without the substance"
We the people of the United States, in order to form a more perfect Union ..."
With the signing of the Treaty of Paris in 1783, the U.S. firmly established itself as an independent nation. Six years later, in 1789, George Washington was elected the first President, initiating the form of government, based on the Constitution, that we recognize today. Before 1789, the young nation had been ruled by the Articles of Confederation, written in 1781 in reaction to years of British rule. By 1787, however, it was clear that a more perfect Union was required; while protecting the independence of member states, the Articles of Confederation did not describe the powers of a federal chief executive or a judicial system. The creation of our Constitution and present form of government was informed by these and other considerations that arose during the years of the Confederation. Archival materials and other resources available through EDSITEment-reviewed websites can help your students begin to understand why the Founders felt a need to establish a more perfect Union and how they proposed to accomplish such a weighty task. NOTE: The Constitution uses the spelling "insure." In modern usage "ensure" means "make certain" while "insure" is generally restricted to the narrower meaning "taking out a policy" (i.e., an insurance policy). Two kid-friendly sources of information about the Constitution are Ben's Guide to the U.S. Government (see "U.S. Constitution: 1789") and Congress for Kids (see "Introduction to the Constitution"). Familiarize yourself with the Articles of Confederation. The text of the Articles as well as related documents and information are available at Articles of Confederation via The Avalon Project at the Yale Law School. See also "Articles of Confederation: 1777-1789" from Ben's Guide to the U.S. Government and "The Articles of Confederation" from Congress for Kids. Familiarize yourself with each lesson plan. The first three lessons are intended to provide context. The heart of the unit is Activity 4. Download copies of the documents used in Activity 4 and duplicate them as necessary. When the American Revolution succeeded, what did the colonists need to do? As stated on America's Story, a link from the EDSITEment resource American Memory, "When the Colonies declared their independence from Britain, they had a flag and an army. What they lacked was a government." What are the responsibilities of independence? Pose a hypothetical situation to the class. Imagine that, on a field trip to Tahiti, the students became stranded—without any adults and with little hope of being rescued in the foreseeable future—on a very hospitable tropical island. Start with a brief, general discussion about such matters as: How will you work together? How will you create rules? How will you deal with people who group members think are not following the rules? If the students worked in groups, allow time for sharing. Now share with the class the political cartoon The Horse America, Throwing His Master and its title, available through a link from the EDSITEment resource American Memory. What do the students observe in the cartoon? What is the cartoonist saying? What was happening in 1779? Encourage class discussion. Having just released themselves from Britain's monarchy, what would the colonists fear? Judging from some of the complaints the colonists had against Britain, what might some of their concerns be for any future government? As in the hypothetical situation on the desert island, what decisions would the colonists have to make about forming a new government out of 13 colonies, which, until 1776, had basically been running themselves independently? Make sure every student has in hand a copy of the Preamble to the Constitution. The text of the Preamble is available through the EDSITEment-reviewed resource The Avalon Project at the Yale Law School. Read the Preamble to the class. Tell students their goal is to learn what the Preamble means. Continue by sharing with students the lyrics for "The Preamble," from the television series "Schoolhouse Rock," created by American Broadcasting Companies, Inc. You can find the lyrics on the Internet; just do a search for "Schoolhouse Rock" on a search engine such as google.com or yahoo.com. Discuss what the students think the words of the Preamble mean. Then divide the class into six small groups. Assign each group a phrase from the Preamble to interpret and provide each group with documentary evidence of what the phrase means (sources listed below). It's the job of group members to share the document they were given and to offer their own interpretation of what their assigned phrase means. For a case to arrive at the Supreme Court, it must be difficult to decide. What good points are there on both sides of the case Harper v. Virginia Board of Elections? It costs money to hold an election. The tax being charged at Virginia polling places was used by counties for expenses such as conducting voting and by the state to support public education. The maximum tax was only $1.50. Shouldn't anyone be happy to pay such a small amount for the privilege of voting and to help pay for the voting process? Would it be fair to ask people who do not vote to pay for voting through some other tax, such as a tax on items you buy at the store (a sales tax)? On the other hand, if you have no money at all, is that a good reason to keep you from voting? Another word for justice is fairness. What happens in our country to make sure that things are fair? What does it mean to establish justice? After the exercise is completed, share with students the actual outcome (conclusion) of the case. Print out the abstract for Burson v. Freeman from the EDSITEment-reviewed website Oyez. For a case to arrive at the Supreme Court, it must be difficult to decide. What good points are there on both sides of this case? Shouldn't voters be able to walk to the polling place in peace and quiet (such peace and quite could be considered one kind of domestic tranquility) without someone trying to get them to vote for their candidate? On the other hand, don't we have the right to talk to people about candidates we want elected? What do you think the court decided? What does it mean to "insure domestic tranquility"? How did the case Burson v. Freeman ensure "domestic tranquility"? What other examples of "domestic tranquility" can you list? Why did the President have to ask Congress to declare war? Why didn't he declare war himself? Why does it make sense to require the President to ask Congress? How does that help provide for the "common" defense? 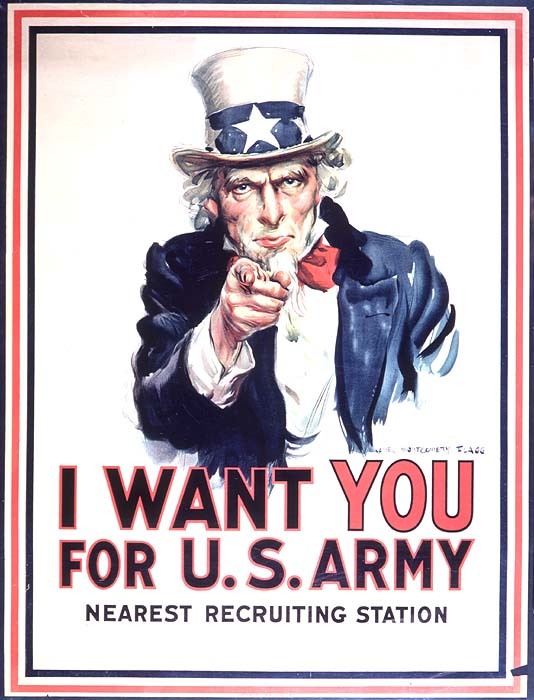 What is the point of the Uncle Sam poster? How does our government today "provide for the common defense"? In 1906, no one was required to inspect meat that was sold to the American public. Public reaction to Upton Sinclair's book The Jungle was a major factor in the passage of the 1907 Meat Inspection Act, which established a system of meat inspection that lasted until July 1996, when the federal government announced new rules requiring more scientifically advanced methods of meat inspection. Shouldn't the companies that sell meat inspect the meat they sell? Why should the government have a system for inspecting meat? How do meat inspections "promote the general welfare"? What else does the government do to promote the general welfare? What does "promoting the general welfare" mean? For a case to arrive at the Supreme Court, it must be difficult to decide. What good points are there on both sides of this case? Why do some people believe parents should be required to send their children to school? On the other hand, shouldn't parents be able to raise their kids the way they want? What do you think the Supreme Court decided in this case? Look up "liberty" in the dictionary. What does liberty mean? What might happen if everybody felt s/he had the liberty to do what ever s/he wanted no matter what the consequences? When, why and how should liberties ever be restrained ... and when should they not be? What does it mean to "secure the blessings of liberty to ourselves"? What is being celebrated in the poster? 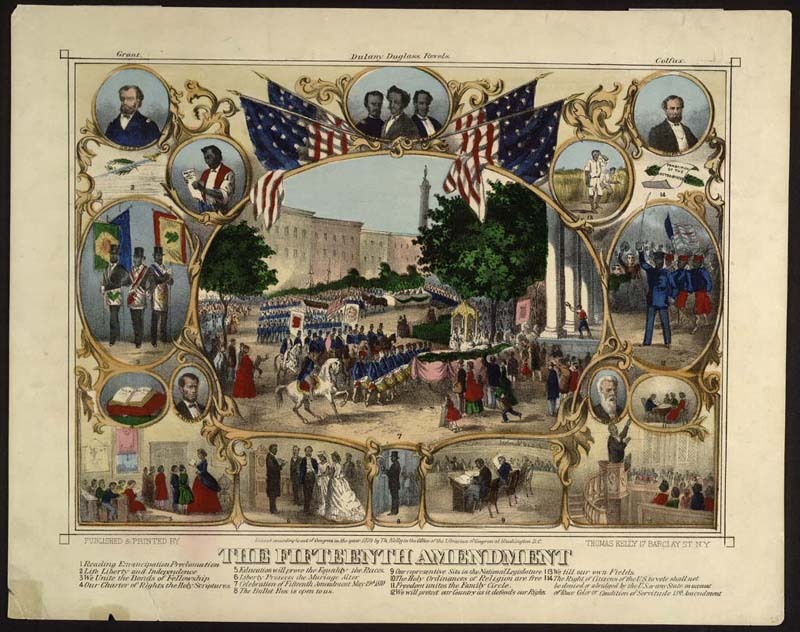 How did the Fifteenth Amendment secure the blessings of liberty to those who had been enslaved? That's an easy question, but here's a hard one: How did the Fifteenth Amendment secure the blessings of liberty to those who had NOT been enslaved? Share the actual outcome (conclusion) of the case. Wouldn't some children your age be tempted to leave school and take up a job if they could? What's wrong with that? 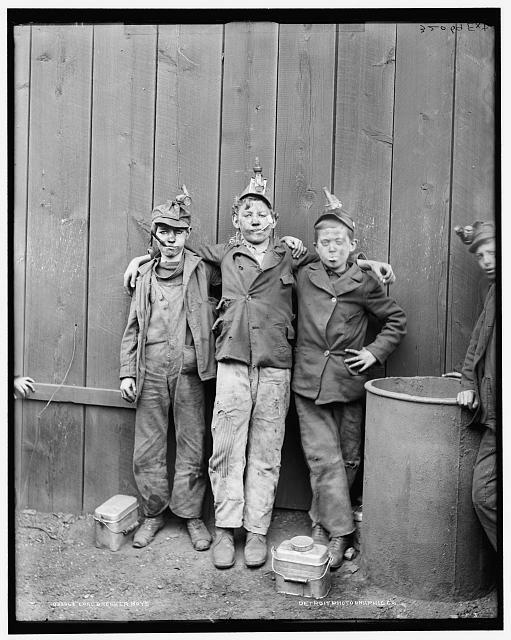 Why are there no more coal breaker boys? The Constitution is still being changed with amendments. Our country's laws are still being changed today. How does improving the rules today help secure the blessings of liberty for people in the future (that's what "posterity" means)? Can you think of some other ways the government makes sure people in the future will have liberty? What does "securing the blessing of liberty to our posterity" mean? SOUND EXPERIMENT 7: The final experiment in sound is a student activity for individuals or groups. To complete it, your students will need to have access, either inside or outside of class, to the online links provided in the Sonnet Bank. Conceivably, you might download a selection of sonnets for your students, but this is unadvisable, unless you have a great deal of time on your hands! Alternatively, you could provide students with a printout of the list only, and make the task of locating and copying their chosen sonnet part of the assignment (although this may be difficult with some of the lesser-known writers). Students will also need to have access to a tape recorder. In case access to tape recording activity is limited, the exercise below describes both individual and small group options. Start by sharing with your students some details about the history of the sonnet form. Provide students with a little bit of historical context. Perhaps the central fact in the history of the sonnet in English is that it has always been an old form, an inherited form. As we have seen, when Wyatt and Surrey began writing sonnets for the first time in the sixteenth century, they were adapting a well-established Italian model that had been around for more than a century. The ironic intent of Shakespeare's My mistress' eyes are nothing like the sun (Sonnet 130), for example, presupposes a knowledge of how the beloved is traditionally praised in sonnet sequences. Yet sonnet writers from the sixteenth to the twentieth century have continued to find ways of making this old form new, stretching and tweaking and morphing its features to suit new circumstances, new tastes, new purposes. When Romantic poets John Keats and William Wordsworth revived the sonnet form in the early nineteenth century, they were rescuing and reinventing a poetic form that had been out of fashion for over a century. Now that they know a little about the various stages of sonnet development, students are ready to look through the contents of the Sonnet Bank and choose an interesting sonnet from any historical period. You could have students choose sonnets individually, or, to ensure coverage of all four historical periods, ask students to count off by fours and having those in group 1 look at Elizabethan, group 2 at Romantics, and so on. Their assignment will be to 1) read and understand the sonnet thoroughly, looking up any terms that need defining; 2) learn about the sonnet's author (in the case of some the more obscure writers, this may be a challenge; in other instances, they may find the amount of information a bit overwhelming); 3) write a few paragraphs answering the question "how does sound influence meaning in your chosen sonnet? "; and 4) produce a tape recorded performance of the poem. The recordings could be produced individually, in pairs, or in groups; if in groups, it might be feasible to produce the recordings as a class activity. In any case, encourage students to try some of the sound experiments discussed above on their own; students may wish to make a number of recordings before they settle on one that seems the best. Have students present their recordings to other students as a class; alternatively, you might have students share the recordings they made in small groups, then have each group choose a favorite. Before playing a selection from their tape, students should say a few words about the writer they chose and the period in which he or she wrote. Students should also talk about the kinds of sound experiments they performed, as well as how they finally settled on one particular performance as the best. In the course of listening to a wide variety of sonnets, you should also have opportunities to discuss some of the similarities and differences between sonnets of different time periods. "When in disgrace with fortune and men's eyes" (Sonnet 29). In the hypothetical situation in Activity 1, did the class arrive at a system that allowed individuals to operate always as they please? Probably not. Though ideas may have differed on how to deal with being stranded, every idea likely involved people working together to some degree through compromise. For the most part, the Articles of Confederation, adopted in 1777 and ratified in 1781, allowed each state to do as it pleased! Important decisions had to be agreed upon by the states unanimously, which was nearly impossible. Such protections were a response to the fear of a strong central government (such as a monarchy). Protecting the rights of states was a primary concern of those who drafted the Articles. A federal government was established, but that government had very little power to compel states to do anything such as pay taxes, send representatives to Congress, or help another state. The Articles proved to be a weak system of government. The federal government only had the power to declare war and manage foreign affairs. Under the Articles, each state worked independently. Chaos erupted from this system of government. Something had to be done, but the road ahead proved to be a bumpy one. While Americans were glad to be free of British rule, they were used to being sovereign and wanted to stay that way. Under the Articles of Confederation, the federal government had very little power to compel states to act. It was very difficult to get representatives from the states to show up at meetings. This story, available on America's Library, a link from the EDSITEment resource American Memory, shows how the U.S. almost failed to sign the Treaty of Paris, which formally ended the American Revolution and granted to the new country land all the way to the Mississippi River. The first and last sentence of page 366 (locate by using the Find function of your browser to locate "Page 366"—from the entry for June 27, 1786, available on the EDSITEment resource American Memory), reveal that by 1786, the U.S. was virtually out of money. Having just fought a long and difficult war, the federal government had incurred great debt. However, Congress did not have the power to compel states to contribute money to the national treasury. The Union might go broke because the federal government had no sure way of raising money! Assign each group to create its own picture book version of the Preamble. Each phrase should be written on its own page with an appropriate illustration. If desired, the group can add an introduction and/or conclusion (about a paragraph long each) for their book. Give the groups an opportunity to share their books with the class. Technically savvy classes could use programs such as PowerPoint or HyperCard to create slide versions of the assignment, which could then be posted online. An alternative way to organize this lesson would be to assign a page to each student group, creating a single class book. Students can create a documentary timeline that demonstrates how our nation has continued to become "more perfect," fulfilling and extending the promises set forth in its founding documents. A good place to start would be the American Memory Timeline from the Library of Congress. Students can interview parents or grandparents to discuss how laws and concepts of justice have changed in their lifetimes. The EDSITEment lesson plan "Listening to History" introduces students to the experience of capturing oral history. Through the EDSITEment-reviewed website Oyez, students can research the history of the Supreme Court and find out what cases are on its docket today. How does the language of the Preamble to the U.S. Constitution reflect historical events and the goals the Founders had for the future? What does the Preamble mean?